The ISSR Executive Committee have asked ISSR member Sir John Houghton, to write about global warming, climate change and issues of sustainability from the point of view of both science and challenges to religious believers. In this essay, I first list some of the growing threats to the environment and introduce the important concept of sustainability. I then explain the threat arising from human induced climate change, summarising its scientific basis and the most significant impacts. I proceed to outline the action that is necessary to halt climate change. Finally, I emphasise the moral imperative for action and suggest how religious believers in particular should respond to the challenge. It has always been important to look after our local environment if only so that we can pass on to our children and grandchildren an environment at least as good as we have enjoyed. Today, however, it is not just the local environment that is at risk but the global environment. Small amounts of pollution for which each of us is responsible are affecting everyone in the world. For instance, very small quantities of chlorofluorocarbons (CFCs) emitted to the atmosphere from leaking refrigerators or some industrial processes have resulted in degradation of the ozone layer. Of greater importance is the carbon dioxide that enters the atmosphere from the burning of fossil fuels, coal, oil and gas, which is leading to damaging climate change. Pressures from rapidly increasing world population and from over-use of the earth’s resources are making such problems much more acute and exacerbating the damage both to the natural world and to human communities. The perils associated with human induced climate change are now recognised much more widely. They will occur on a global scale and will be experienced most severely in the world’s poorer countries. It is frequently described by responsible scientists and politicians as probably ‘the greatest problem the world faces’. Global pollution demands global solutions. To arrive at global solutions it is necessary to address human attitudes very broadly, for instance those concerned with resource use, lifestyle, wealth and poverty. They must also involve human society at all levels of aggregation – international organisations, nations with their national and local governments, large and small industry and businesses, non-governmental organisations (e.g. churches) and individuals. To take into account the breadth of concern, a modern term that is employed to describe such environmental care is ‘sustainability’. Imagine you are a member of the crew of a large space ship on a voyage to visit a distant planet. Your journey there and back will take many years. An adequate, high quality source of energy is readily available in the radiation from the sun. Otherwise, resources for the journey are limited. The crew must manage the resources extremely carefully. A local biosphere is created in the spacecraft where plants are grown for food and everything is recycled. Careful accounts are kept of all resources, with especial emphasis on non-replaceable components. That the resources be sustainable at least for the duration of the voyage, both there and back, is clearly essential. Planet Earth is enormously larger than the spaceship I have been describing. The crew of Spaceship Earth, over six billion and rising, is also enormously larger. The principle of Sustainability should be applied to Spaceship Earth as rigorously as to the much smaller vehicle on its interplanetary journey. In a publication in 1966, Professor Kenneth Boulding, a distinguished American economist, introduced the image of Spaceship Earth. He contrasted an ‘open’ or ‘cowboy’ economy (his name for an unconstrained economy) with a ‘spaceship’ economy where sustainability is paramount. Sustainability is an idea that can be applied to activities and communities as well as to physical resources. Environmental sustainability is strongly linked to social sustainability – creating sustainable communities – and sustainable economics. Sustainable Development provides an all-embracing term. The Brundtland Report, “Our Common Future” of 1987 provides a milestone review of Sustainable Development. There have been many definitions of Sustainability. The simplest I know is ‘not cheating on our children’; to that may be added, ‘not cheating on our neighbours’ and ‘not cheating on the rest of creation’. In other words, not passing on to our children or any future generation, an Earth that is degraded compared to the one we inherited, and also sharing common resources as necessary with our neighbours in the rest of the world and caring properly for the non-human creation. The human activities of an increasing world population together with accompanying rapid industrial development, are leading to degradation of the environment on a very large scale. Notwithstanding, some deny that degradation is happening; others that degradation matters. Scientists have an important role in ensuring the availability of accurate information about degradation and also in pointing to how humans can begin to solve the problems. Many things are happening in our modern world that are just not sustainable2. In fact, we are all guilty of cheating in the three respects I have mentioned. Five of the most important causes of unsustainability are: Human induced Climate Change, Deforestation and Land Use Change, over Consumption of Resources, over generation of Waste and over Fishing. These are increasingly impacting human communities and ecosystems, in particular leading to large scale loss of Biodiversity and loss of Soil as well as threatening Food Supplies. These issues present enormous challenges. For much of the rest of this paper I will address in some detail the world’s most serious environmental and sustainability issue – one with which I have been particularly concerned – that of global warming and climate change, explaining the essential roles of both science and faith in getting to grips with it. I begin with a quick summary of the basic science. By absorbing infra-red or ‘heat’ radiation from the earth’s surface, ‘greenhouse gases’ present in the atmosphere, such as water vapour and carbon dioxide, act as blankets over the earth’s surface, keeping it on average 20 or 30ºC warmer than it would otherwise be. The existence of this natural ‘greenhouse effect’ has been known for nearly two hundred years; it is essential to the provision of our current climate to which ecosystems and we humans have adapted. A record of past climate and atmospheric composition is provided from analyses of the composition of the ice and air bubbles trapped in the ice obtained from cores drilled from the Antarctic or Greenland ice caps. From such records we find that, since the beginning of the industrial revolution around 1750, one of the greenhouse gases, carbon dioxide has increased by nearly 40% and is now at a higher concentration in the atmosphere than probably for millions of years. Chemical analysis demonstrates that this increase is due largely to the burning by humans of fossil fuels – coal, oil and gas. If no action is taken to curb these emissions, the carbon dioxide concentration will rise during the 21st century to two or three times its pre-industrial level. Direct measurements of the near surface air temperature with accurate thermometers under controlled conditions over much of the globe are only available from around 1850. The record of global average temperature from the mid nineteenth century shows a lot of variability from year to year and decade to decade due to natural variability within the climate system. There are also changes which can be attributed to other causes such as variations in the amount of radiation from the sun or to the effect of volcanic eruptions that emit large quantities of dust and other particles into the stratosphere where they remain up to a few years tending to cool the climate. For instance the rise in global average temperature in the early 20th century – up to about 1940 can be attributed to a slightly warmer sun and comparative absence of volcanic eruptions during that period. The period of ‘global dimming’ from about 1950 to 1970 is most likely due to the increase in atmospheric particles (especially sulphates) from industrial sources. These particles reflect sunlight, hence tending to cool the surface and mask some of the warming effect of greenhouse gases. However, the substantial rise in global average temperature during the last 50 years is well outside the range of known natural variability and cannot be attributed to any of these natural causes. Careful analysis shows that most of this rise is almost certainly due the growing emissions of greenhouse gases (especially carbon dioxide) into the atmosphere during this period. Some confirmation of this is also provided by observations of the warming of the oceans. Fig. 1 Variations of the globally averaged earth’s surface temperature (combined land surface air and sea surface temperatures) relative to 1800-1900, smoothed with decadal averaging; 500 -1860, N Hemisphere from proxy data (shading indicates substantial uncertainty in the reconstructed temperatures); 1861-2010, global instrumental observed; 2010-2100 IPCC projections using a range of assumptions about emissions of greenhouse gases and with further shading to indicate scientific uncertainty. 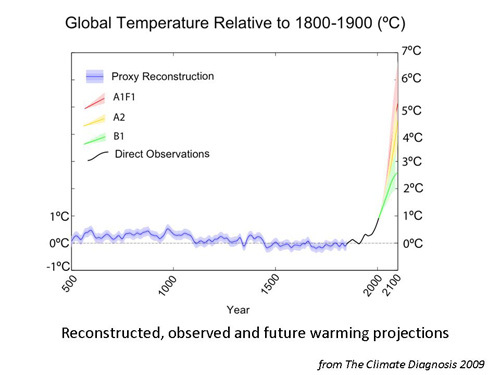 Over the 21st century the rise in global average temperature is projected to continue and rise by between 2 and 6 ºC (3.5 to 11 ºF) from its preindustrial level; the range represents different assumptions about emissions of greenhouse gases and the sensitivity of the climate model used in making the estimate (Fig 1). For global average temperature, a rise of this amount is very large. For instance, its difference between the middle of an ice age and the warm periods in between is only about 5 or 6 ºC (9 to 11 ºF). So, associated with likely warming in the 21st century will be a rate of change of climate equivalent to say, half an ice age in less than 100 years – a larger rate of change than for at least 10,000 years. Adapting to this will be difficult for both humans and many ecosystems. Talking in terms of changes of global average temperature, however, tells us rather little about the impacts of global warming on human communities. Some of the most obvious impacts will be due to the rise in sea level that occurs mainly because ocean water expands as it is heated. Melting of ice on glaciers and polar ice caps adds to the rise. The projected total rise is estimated to be up to one metre this century and the rise will continue for many centuries – to warm the deep oceans as well as the surface waters takes a long time. This will cause large problems for human communities living in low lying regions. Sea defences in many parts of the UK, for instance in the eastern counties of England, will need to be improved at substantial cost. However, many areas in other parts of the world, for instance in Bangladesh (where about 10 million live within the one metre contour – Fig 2), southern China, islands in the Indian and Pacific oceans and similar places elsewhere in the world will be impossible to protect, and many millions will be displaced. Fig. 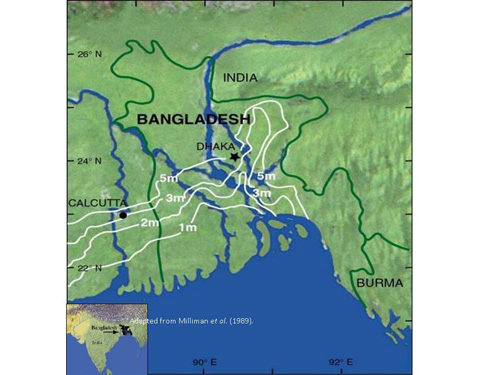 2 Land affected in Bangladesh by various amounts of sea level rise (from J.D.Milliman). There will also be impacts from extreme events. The extremely unusual high temperatures in central Europe during the summer of 2003 led to the deaths of over 20,000 people. Careful analysis leads to the projection that such summers are likely to be average by the middle of the 21st century and cool by the year 2100. Water is becoming an increasingly important resource. A warmer world will lead to more evaporation of water from the surface, more water vapour in the atmosphere and more precipitation on average – recent observations indicate that this increase in precipitation is occurring. Of greater importance is the fact that increased condensation of water vapour in cloud formation leads to increased latent heat of condensation being released. Since this latent heat release is the largest source of energy driving the atmosphere’s circulation, the hydrological cycle will become more intense. This means a tendency to more intense rainfall events and also less rainfall in some semi-arid areas. Since on average, floods and droughts are the most damaging of the world’s disasters, their greater frequency and intensity is bad news for most human communities in the developed world but even worse news for many parts of the developing world – for instance, for south east Asia and sub-Saharan Africa where such events already occur only too frequently. Careful estimates from climate models suggest that the risk of such events could increase up to about a factor of 5 by mid century, particularly if there is little decrease in global greenhouse gas emissions. It is these sorts of events that provide some credence to the comparison of climate change with weapons of mass destruction. Sea level rise, changes in water availability and extreme events will lead to increasing pressure from environmental refugees. A conservative estimate has suggested that, due to climate change, there could be more than 150 million extra refugees by 2050. Where can these refugees go in our increasingly crowded world? In addition to the main impacts summarised above are changes which are less certain, but which if they occurred would be highly damaging and possibly irreversible. For instance, large changes are being observed in polar regions. With the rising temperatures over Greenland, it is estimated that melt down of the ice cap could begin during the next few decades. Complete melt down is likely to take many centuries but it would add 7 metres (23 feet) to the sea level. Rising temperatures in polar regions are also likely to result in the release of methane, a powerful greenhouse gas, trapped in large quantities in the permafrost under the surface. This could become a more serious and imminent threat if global average temperatures were allowed to rise above about 4ºC. A further concern is regarding the Thermo-Haline Circulation (THC) – a circulation in the deep oceans, partially sourced from water that has moved in the Gulf Stream from the tropics to the region between Greenland and Scandinavia. Because of evaporation on the way, the water is not only cold but salty, hence of higher density than the surrounding water. It therefore tends to sink and provides the source for a slow circulation at low levels that connects all the oceans together. This sinking assists in maintaining the Gulf Stream itself. In a globally warmed world, increased precipitation together with fresh water from melting ice will decrease the water’s salinity making it less likely to sink. The circulation will therefore weaken and possibly even cut off, leading to large regional changes of climate. Evidence from paleoclimate history shows that such a cut-off has occurred at times in the past. It is such an event that is behind the highly speculative happenings in the film, The Day after Tomorrow. I have spoken so far about adverse impacts. You will ask, ‘are none of the impacts positive?’ There are some positive impacts. For instance, in Siberia and other areas at high northern latitudes, winters will be less cold and growing seasons will be longer. Also, increased concentrations of carbon dioxide have a fertilising effect on some plants and crops which, providing there are adequate supplies of water and nutrients, will lead to increased crop yields in some places, probably most notably in northern mid latitudes. However, careful studies demonstrate that adverse impacts will far outweigh positive effects, the more so as temperatures rise more than 1 or 2 ºC (2 to 3.5 ºF) above preindustrial. In addition to the direct impact on human communities are the impacts on ecosystems with an estimated 15-40% of species potentially facing extinction after only 2ºC of warming. Further major irreversible impacts on marine ecosystems are likely because of acidification of ocean water as a direct effect of rising carbon dioxide levels. A review of the economics of climate change by Sir Nicholas Stern provides estimates of the likely cost of climate change impacts supposing no mitigation action is taken. I quote from the report’s summary. These estimates in economic terms do not take into account the human cost in terms of deaths, dislocation, misery, lack of security etc that would also accompany large scale climate changes. Nor do they emphasise sufficiently the predominance of impacts in poor countries. Can we believe the evidence? Many people ask how certain is the scientific story I have presented. Let me explain that it is based largely on the very thorough work of the Intergovernmental Panel on Climate Change (IPCC), formed in 1988 jointly by two UN bodies, the World Meteorological Organisation and the United Nations Environment Programme. I had the privilege of being chairman or co-chairman of the Panel’s scientific assessment from 1988 to 2002. The IPCC has produced four assessments – in 1990, 1995, 2001 and 2007 – covering science, impacts and analyses of policy options. The IPCC 2007 report is in three volumes, each of about 1000 pages and containing many thousands of references to the scientific literature. It confirms the main conclusions of previous reports, and, in the light of six more years of climate change observations and research, is able to express them with greater certainty. Several thousand scientists drawn from many countries were involved as contributors and reviewers in these assessments. Our task was honestly and objectively to distinguish what is reasonably well known and understood from those areas with large uncertainty and to present balanced scientific conclusions to the world’s policymakers. Summaries of the assessments, prepared by the scientists were reviewed sentence by sentence and agreed at formal intergovernmental meetings involving delegates typically from around 100 countries and simultaneous translation into six languages. These were strictly scientific, not political meetings. Text could only be changed on the bases of clarity or scientific accuracy. No assessment on any other scientific topic has been so thoroughly researched and reviewed. In June 2005, just before the G8 Summit in Scotland, the Academies of Science of the world’s 11 most developed countries (the G8 plus India, China and Brazil) issued a statement endorsing the conclusions of the IPCC and urging world governments to take urgent action to address climate change. The world’s top scientists, who could not have spoken more strongly, have continued to provide unequivocal supporting statements regarding IPCC work and conclusions. There are, however, strong vested interests that over the last twenty years have spent tens of millions of dollars on spreading misinformation about the climate change issue. They particularly targeted the IPCC and scientists involved with the IPCC reports. For instance in 2009, by selecting particular words or sentences, they purported to show that thousands of emails hacked from computers at the University of East Anglia (UEA) demonstrated dishonesty and fraud by some of UEA’s climate scientists. However, thorough investigations by a number of official bodies have since found no evidence of fraud or scientific malpractice. They also gave large publicity (amplified by the media) to a mistake, stemming from a typographical error, in one of the 1000 pages of the 2007 IPCC Impacts Report that suggested that Himalayan glaciers could disappear by 2035 – the date should have read 2350. A regrettable error, but none of the conclusions in the Summary sections of the IPCC Report were affected by that mistake. Further, a great deal of misleading information regarding the IPCC has been published on the Internet that even a cursory inspection of any of the IPCC Reports will show to be false. In the early 1990s, they began denying the existence of any scientific evidence for climate change due to human activities. More recently they have largely accepted the fact of anthropogenic climate change but argue that its impacts will not be great, that we can ‘wait and see’ and in any case we can always ‘fix’ the problem if it turns out to be substantial. The scientific evidence cannot support such arguments. In combating climate change, action has to be of two kinds, adaptation and mitigation. Because of the substantial commitment to climate change that is already in train, much attention needs to be given to the development of means for adaptation in order to limit the damage – for instance from sea level rise or extreme events. Because of large changes in many areas in water availability, the management of water resources, and the development of new crop strains possessing heat and drought resistance, are examples of areas that need to be urgently addressed. Equally urgent is to address the mitigation of climate change through reductions in greenhouse gas emissions in order to slow climate change and eventually to halt it. The Objective of the FCCC in its Article 2 is “to stabilise greenhouse gas concentrations in the atmosphere at a level that does not cause dangerous interference with the climate system” and that is consistent with sustainable development. Such stabilisation would also eventually stop further climate change. However, because of the long time that carbon dioxide resides in the atmosphere, the lag in the response of the climate to changes in greenhouse gases (largely because of the time taken for the ocean to warm), and the time taken for appropriate human action to be agreed, the achievement of such stabilisation will take at least the best part of a century. Global emissions of carbon dioxide to the atmosphere from fossil fuel burning are currently over 30 billion tonnes per annum and rising rapidly (Fig 3). Unless strong measures are taken they will reach two or even three times their present levels during the 21st century and stabilisation of greenhouse gas concentrations or of climate will be nowhere in sight. To stabilise carbon dioxide concentrations, emissions during the 21st century must reduce to well below their present levels by 2050 (Fig 3) and to a small fraction of their present levels before the century’s end. The reductions in emissions must be made globally; all nations must take part. However, there are very large differences between greenhouse gas emissions from different countries. Expressed in tonnes of CO2 per capita per annum, they vary from over 25 for the USA, about 10 for Europe, 5 for China and 2.5 for India. Further, the global average per capita, currently about 4 tonnes per annum, must fall substantially during the 21st century. The challenge is to find ways to achieve reductions that are both realistic and equitable. I return to this issue later. The FCCC recognised that developed countries have already benefited over many generations from abundant fossil fuel energy and that developed countries should therefore be the first to take action. First, developed countries were urged by 2000 to return to 1990 emission levels, something achieved by very few countries. Secondly, in 1997, the Kyoto Protocol was agreed as a beginning for the process of reduction, averaging about 5% below 1990 levels by 2012 by those developed countries who ratified the protocol. It represents an important start demonstrating the achievement of a useful measure of international agreement on a complex issue. It also introduces for the first time international trading of greenhouse gas emissions so that reductions can be achieved in the most cost effective ways. Since Kyoto was agreed, however, progress has been has been very disappointing. Carbon dioxide emissions have continued to rise (Fig 3) and despite high expectations, no further international agreements have been agreed. Much discussion has taken place about what target level should be the aim for the stabilization of greenhouse gases. At the meeting of the world’s countries under FCCC auspices in Copenhagen in December 2009, there was a very widely supported acceptance of a target consistent with keeping the global average temperature rise from its preindustrial value below 2 deg C – a target first put forward by the Council of the European Union in 1996. This is actually a very tough target and requires tough and urgent action for its realization. It would require global emissions of carbon dioxide to peak by about 2015 and by 2050 to be reduced by more than 50% from 1990 levels (Fig 3). However, no formal action was taken at Copenhagen towards this end although a number of individual countries, including the UK, have committed to national targets with this aim in view. 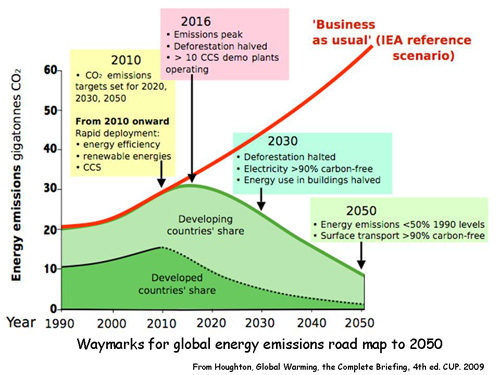 The diagram of waymarks on the energy road map (Fig 3) shows that, to achieve a rise in global average temperature of less than the target of 2ºC above preindustrial, global emissions of carbon dioxide have to peak well before 2020 and then decline at an average of 3% p.a. until 2050. To aim at a later peak will reduce the probability of achieving the 2ºC target to well under 50%. A more serious consequence of delay is the increase in likelihood of the actual rise being around 4ºC for which the damaging impacts would be very large indeed, much greater than described in the earlier sections of this briefing paper. The UK government’s Climate Change Committee points out this danger in its first report of December 2008 and emphasises strongly the vital importance of the world finding the determination and resolve to continue to aim at a CO2 emissions peak before 2020. The urgency of action required cannot be stressed too strongly. Some leading climate scientists led by Professor James Hansen of the USA are arguing that the target of 2º C is insufficient to prevent serious risk of large unacceptable climate change and that a tougher target should be the aim. Although it is not likely to be possible to reach a tougher target this century, Hansen and others are beginning to look into ways of drawing down large amounts of CO2 from the atmosphere to be sequestered in trees, soils or in other reservoirs. It is important that preparations of this kind are begun as it may well turn out that this more drastic action is required. I now address actions that need to be taken if the reductions required are to be achieved. Four sorts of actions are required. First, there is energy efficiency. Approximately one third of energy is employed in buildings (domestic and commercial), one third in transport and one third by industry. Large savings can be made in all three sectors, many with significant savings in cost. But to achieve these savings in practice will require appropriate encouragement and incentives from central and local government and a great deal of determination from all of us. Take buildings for example. All new buildings need to include energy sources that are carbon-free. Existing buildings need to be modified for much greater energy efficiency. In the transport sector, large efficiency savings are also possible. For cars, for instance, a progression of technologies between now and 2050 is anticipated beginning with petrol/electric hybrids then wholly electric cars using electricity from carbon free sources. Within the industrial sector a serious drive for energy savings is already occurring. A number of the world’s largest companies have already achieved savings in energy that have translated into money savings of many billions of dollars. Secondly, there are possibilities for sequestration of carbon underground, for instance, in spent oil and gas fields or in suitable rock formations. Because of the large number of coal fired plants being built especially in China and India rapid development, demonstration and implementation of carbon capture and storage (CCS) in all new plants is a very high priority. Thirdly, a wide variety of non-fossil-fuel sources of energy is available for development and exploitation, for instance, biomass (including waste), solar power, hydro, wind, wave, tidal, geothermal energy and nuclear. The potential of solar power, both photovoltaic and concentrated solar power (known as CSP in which solar energy is used to drive heat engines), is especially large, particularly in developing countries and near desert areas with high levels of sunshine. For instance, large solar projects are envisaged that couple electricity and hydrogen generation with desalination in desert regions where water is a scarce resource. The opportunities within industry for innovation, development and investment in all these areas are large. Further, the potential is particularly large for modern biomass sources to provide reliable energy for rural areas especially in the developing world. Such provision could maintain the sustainability of rural communities and help to stem the growing migration to large cities. Fourthly, global deforestation especially in the tropics, that today accounts for about 20% of carbon dioxide emissions, would need to be halted early in the period. World leaders meeting at the G8 Summit in Scotland in 2005 asked the International Energy Agency (IEA) to study what changes would be required in the world’s energy production and use for the 2º target mentioned above to be achieved. IEA’s Energy Technology Perspectives published in 2010 describes in detail the technologies and investment required – it clearly demonstrates that the required technology is available. But can the world afford to do what is necessary? The IEA addresses the costs beginning with an estimate of the total cumulative energy investment needs for business-as-usual (their Reference scenario – see Fig 3) from 2005 to 2050 – it amounts to about 6% of cumulative world GDP. By far the largest proportion of this relates to investments that consumers make in capital equipment that consumes energy, from vehicles to light bulbs to steel plants. To follow a scenario (Fig 3) that has a good chance of meeting the 2 deg target, additional investment needs over this period would be about 1% of cumulative world GDP – a figure similar to those quoted by the IPCC and by the Stern Review. The IEA also point out that following this scenario will also result in fuel savings over the period amounting to between 1 and 2% of world GDP – more than the additional required investment. Further, in addition to the mitigation of climate change, many other benefits towards other aspects of sustainability can be identified associated with the revolution in energy generation and use that I have outlined. The overall net cost of this action, often quoted as a main concern, would appear to be small even possibly negative and certainly far less than the costs of taking no action that were mentioned earlier. At the end of this section on action, we are bound to ask, can it be done? Figure 3 summarizes elements of the road map that will have to be fulfilled for a 50% chance of success in achieving the 2ºC target. It represents an extremely ambitious timetable that can only be fulfilled if the programme of energy transformation is raised to a much higher level of urgency – more like that prevailing in time of war. In 1941, at the request of Winston Churchill, President Franklin Roosevelt introduced his programme of Lease-Lend to aid the war in Europe, under which the United States’ industrial machine turned round within a few months to providing military equipment, tanks, aircraft etc, on a very large scale – a programme that provided a boost to the US economy that helped much in bringing it out of the depression of the 1930s. The threat of climate change is such that urgent and concerted action of a similar kind is now required – action that could also provide positive assistance in addressing the current financial crisis. People often say to me that I am wasting my time talking about Global Warming. ‘The world’ they say ‘will never agree to take the necessary action’. I reply that I am optimistic for three reasons. First, I have experienced the commitment of the world scientific community (including scientists from many different nations, backgrounds and cultures) in painstakingly and honestly working together to understand the problems and assessing what needs to be done. Secondly, I believe the necessary technology is available for achieving satisfactory solutions. My third reason is that I believe we have a God-given task of being good stewards of creation. In the following paragraphs I speak about this stewardship from my own perspective as a Christian believer. I would encourage those from other faith traditions to engage in parallel reflections from their own theological standpoints. What does stewardship of creation mean? In the early part of Genesis, we learn that humans, made in God’s image, are given the mandate to exercise stewardship/management care over the earth and its creatures (Gen 1 v26,28 & 2 v15). We therefore have a responsibility first to God to look after creation – not as we please but as God requires – and secondly to the rest of creation as ones who stand in the place of God. To expand on what this means, I quote from a document ‘A Biblical vision for creation care’ developed following a meeting of Christian leaders at Sandy Cove, Maryland, USA held in June 2004. According to Scripture only human beings were made in the divine image (Gen. 1:26-27). This has sometimes been taken to mean that we are superior and are thus free to lord it over all other creatures. What it should be taken to mean is that we resemble God in some unique ways, such as our rational, moral, relational, and creative capacity. It also points to our unique ability to image God’s loving care for the world and to relate intimately to God. And it certainly points to our unique planetary responsibility. The same pattern holds true in all positions of high status or relationships of power, whether in family life, education, the church, or the state. Unique capacity and unique power and unique access create unique responsibility. Being made in God’s image is primarily a mandate to serve the rest of creation (Mk 10:42-45). Only in recent decades have human beings developed the technological capacity to assess the ecological health of creation as a whole. Because we can understand the global environmental situation more thoroughly than ever before, we are in a sense better positioned to fulfil the stewardship mandate of Genesis 1 and 2 than ever before. Tragically, however, this capacity arrives several centuries after we developed the power to do great damage to the creation. We are making progress in healing some aspects of the degraded creation, but are dealing with decades of damage, and the prospect of long-lasting effects even under best-case scenarios. We are only too aware of the strong temptations we experience, both personally and nationally, to use the world’s resources to gratify our own selfishness and greed. Not a new problem, in fact a very old one. In the Genesis story of the garden, we are introduced to human sin with its tragic consequences (Genesis 3); humans disobeyed God and did not want him around any more. That broken relationship with God led to broken relationships elsewhere too. Disasters in the environment speak eloquently of the consequences of that broken relationship. We, in the developed countries have already benefited over many generations from abundant fossil fuel energy. The demands on our stewardship take on a special poignancy as we realize that the adverse impacts of climate change fall disproportionately on poorer nations and will tend to exacerbate the increasingly large divide between rich and poor. Our failure to be good stewards is a failure to love God and a failure to love our neighbours, especially our poorer neighbours in Africa and Asia. The moral imperative for the rich countries is inescapable. Some Christians tend to hide behind an earth that they think has no future. But the Scriptures remind us of God’s love for the world for which Jesus died (e.g. John 3, 16; Col 2,20). And Jesus promised to return to earth – earth redeemed and transformed. In the meantime earth awaits that final redemption – although subject to frustration (Rom 8 v 20-22). Such exciting visions of the future add emphasis to the clear injunction of Jesus to be responsible and just stewards until his return (Luke 12 v 41-48). Acting in obedience to this instruction provides an important part of our fulfilment as humans. In our modern world this so often gets lost as we concentrate so much on material gain or economic goals, such as getting rich and powerful. Recent events have illustrated the fragility, even the unreality, of many such goals. Stewardship or long-term care for our planet and its resources brings to the fore moral and spiritual goals. Reaching out for such goals could lead to nations and peoples working together more effectively and closely than is possible with the other goals on offer. Not only do we need goals but also new attitudes and approaches in the drive towards sustainability – again at all levels of society, international, national and individual. I mention two particular examples. First, we need to look seriously at measures of sustainability and accounting tools to apply those measures. For instance, economic performance of countries is currently measured in GDP, a measure that takes no account of environmental or indeed many other concerns; it is a measure that increases with more conflict or more crime! Although considerable effort has been put into other more appropriate measures for instance the Human Development Index (HDI), the concepts of Natural Capital or Environmental Footprint, they are inevitably more complex and none are widely used by policy makers. Considerations of the economy generally take second place to those of the environment. The dominance of the ‘market’ is often also allowed to ride over environmental considerations. The economy, the market and the principles of free trade are ‘tools’ – important tools, but they must not be allowed to be in the position of ‘masters’. A second example of a new attitude to be taken on board, again at all levels from the international to the individual, is that of ‘sharing’. At the individual level, a lot of sharing often occurs; at the international level it occurs much less. Perhaps the most condemning of world statistics is that the rich are getting richer while the poor get poorer – the flow of wealth in the world is from the poor to the rich. Considering Aid and Trade added together, the overwhelming balance of benefit is to rich nations rather than poor ones. Nations need to learn to share on a very much larger scale. We often talk of the ‘global commons’ meaning for example air, oceans or Antarctica – by definition these are ‘commons’ to be shared. But more ‘commons’ need to be identified. For instance, there are respects in which Land should be treated as a resource to be shared, similarly fish and other marine resources. Or, in order for international action regarding climate change to be pursued, how are allowable emissions from fossil fuel burning or from deforestation to be allocated? How do we as a world share these natural resources between us and especially between the very rich – like ourselves – and the very poor? A proposal by the Global Commons Institute is that emissions should first be allocated to everybody in the world equally per capita, then via trading between nations these allocations could be transferred. The logic and the basic equity of this proposal is in principle quite compelling – but is it achievable? Sustainability will never be achieved without a great deal more sharing. Sharing is an important Christian principle that needs to be worked out in practice. John the Baptist preached about sharing (Luke 3 v11), Jesus talked about sharing (Luke 12 v33), the early church were prepared to share everything (Acts 4 v32) and Paul advocated it (2 Cor 8 v13-15). The opposite of sharing – greed and covetousness – is condemned throughout scripture. The sharing of knowledge and skills with those in the third world is also an important responsibility. These new attitudes are not just to provide guidance to policy makers in government or elsewhere. They need to be espoused by the public at large. Otherwise government will not possess the confidence to act. For the public to take them on board, the public have to understand them. To understand, they have to be informed. There is a great need for accurate and understandable information to be propagated about all aspects of sustainability. Christian churches could play a significant role in this. We may feel daunted as we face the seemingly impossible challenge posed by care for the Earth and its peoples and the need for sustainability. But an essential Christian message is that we do not have to carry the responsibility alone. Our partner is no other than God Himself. The Genesis stories of the garden contain a beautiful description of this partnership when they speak of God ‘walking in the garden in the cool of the day’ – God, no doubt, asking Adam and Eve how they were getting on with learning about and caring for the garden. Just before he died Jesus said to his disciples, ‘Without Me you can do nothing’ (John 15, 5). He went on to explain that he was not calling them servants but friends (John 15, 15). Servants are given instructions without explanation; as friends we are brought into the confidence of our Lord. We are not given precise prescriptions for action but are called to use the gifts we have been given in a genuine partnership. Within the creation itself there is enormous potential to assist us in the task; the pursuit of scientific knowledge and the application of technology are an essential part of our stewardship. I often speak of three qualities that should guide our stewardship – honesty, holism (i.e. taking a balanced and integrated view) and humility. The alliteration of 3 H’s assists in keeping them in mind. An unmistakable challenge is presented to the world wide Christian church to take on the God-given responsibilities for caring for creation and caring for the poor. 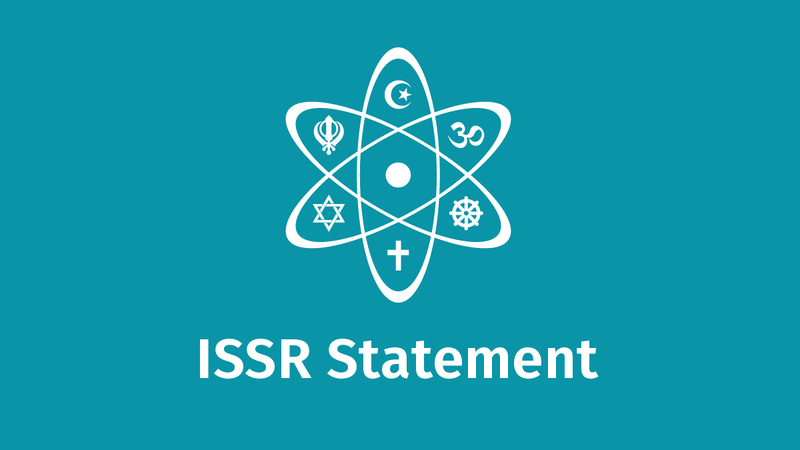 It provides an unprecedented mission opportunity for Christians to take a lead and demonstrate love for God the world’s creator and redeemer and love for our neighbours wherever they may be – remembering the words of Jesus, ‘From everyone who has been given much, much will be demanded’ (Luke 12 48). Ice ages are triggered by regular variations in the Earth’s orbit round the sun that are accurately known from astronomical observations. The Earth is currently in a warm period, the last ice age was at its peak about 20,000 years ago and the next ice age is not for about 50,000 years. Climate Change 2007 in 3 volumes published by Cambridge University Press 2007. Also available on the IPCC web site www.ipcc.ch. My book, John Houghton, Global Warming: the complete briefing, 4th edition, CUP. 2009 is strongly based on the IPCC reports. The Exxon Company and other US energy companies were in the fore of this campaign. See for instance, N.Oreskes & E. M. Conway, Merchants of Doubt, Bloomsbury Press, 2010. Although agreed in 1997 it did not come into force until 2005. The USA has not ratified the Protocol; Australia ratified it in 2008. The IEA is an OECD body responsible for implementation of an international energy programme.